How to create a Technical construction File (TCF). The technical construction file contents should contain sufficient information on components making up the product, product design calculations, product testing, user instructions, and labelling and other relevant information to prove that the product can be safely used. It is the manufactuer’s responsibility to complete the technical construction file. CE marking should not take place until the TCF is completed. The Technical Construction File must be retained by the manufacturer for 10 years following the sale of the last product covered by said TCF. 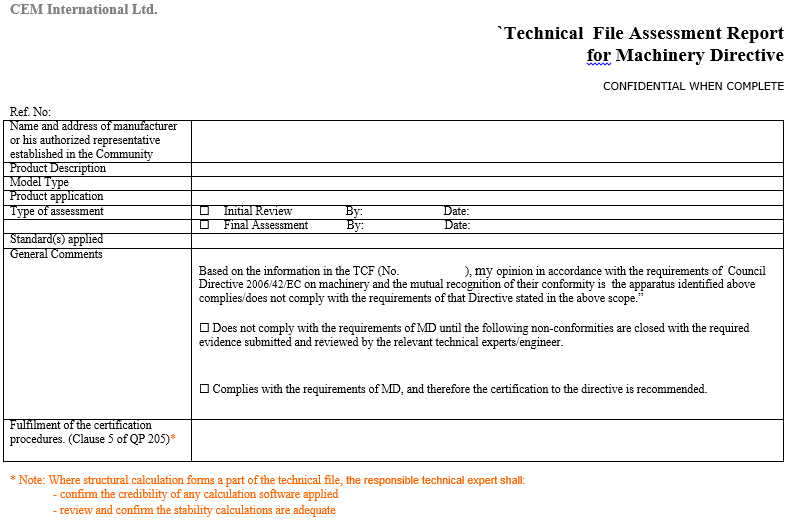 The TCF may be requested by trading standards or other such bodies, the file should be provided to such authorities within 7 days. 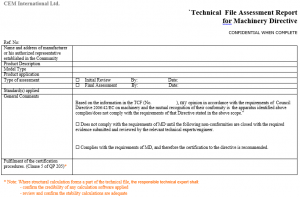 The technical construction file format can be a hard copy, or electronic. Keeping an electronic version not only makes keeping it up to date much easier but also makes provision of a technical construction file sample to the authorities a much easier process. Electronic versions of a TCF should be provided to the authorities upon request within 24 hours. CEM International Ltd. are able upon request to supply a technical construction file checklist or technical construction file template sample to existing customers.